Our final morning keynote focused on the future of the technologies we deploy, ways you can learn from other users and how one major customer is using IFS Applications to help transform its approach to business. Artificial intelligence (AI) is one of the most talked about products out there. But what does it mean to us, to our product and our customers? AI is polarizing. People are either very pessimistic or optimistic. It’s either all over-hyped, or it’ll solve world hunger. Many researchers are looking at general intelligence – computers thinking like humans and handling many complex tasks and skills at the same time. It’s what the doomsday AI scenarios are based on in science fiction – but it’s a long way off still, and it’s certainly not much use in business yet. Let’s look at each of them in turn. No, this is not Neo-jacked into the Matrix. It’s chatbots and natural language processing. As the chatbot is used more and more, it gets better and better at determining intent through machine learning. For customers, IFS Customer Engagement handles calls or other contact from customers rather than users through a chatbot in the first instance, which is really good at handling some queries. There’s need for human intervention or escalation if the chatbot can’t handle it – and that’s what our tool provides. Internally, employees are looking for ways of interacting with their business applications in more natural ways. If you’re calling in sick, you can do so with the chatbot in Skype for Business on your phone, rather than having to call in or open your laptop, which is not a great experience if you’re lying on the sofa with a bucket by your side. The next step is speech-only applications. If you’re driving, you need your hands on the wheel and eyes on the road, so you could only talk to your application. For limited, simple applications, it could work. And, indeed it does (de Vos demos it using Cortana on a smart speaker). A preview program is underway for IFS Applications 10 users, with Volac and Beijer Electronics Group as the first users. People have moved from calendar-based maintenance to usage- or condition-based maintenance, over time. The Internet of Things (IoT) has made this more common, with sensors flagging up problems. But AI opens up predictive maintenance. AI is good at finding patterns in complex data, that might predict failure states, based on historical evidence. Adding AI to automate better is the next logical step in the evolution of automation. Business rules are a very useful form of automation – but they have limitations, including lack of variation over time, without development work. AI could help develop and shift those rules, initially by suggesting changes, but possibly, as quality increases, independently. AI is looking at the historical data and determining what gets approved and what doesn’t. That information can be progressively used to automate more and more routine operations, as the system learns, freeing the user to do more valuable tasks. Optimizations use AI to experiment with different scenarios with a speed humans couldn’t match, and predict the best outcomes. It can also react to problems and reassign tasks very quickly, by assessing all the possible options and picking the best. For example, you can play back the moment a robot arm went wrong, and through the animation of its digital twin, understand what caused it to malfunction. That’s information you can use to prevent the same things occurring again. Whatever you do with IFS, there’s a user group for you. Networking here at the World Conference is great – but it’s only every 18 months. You can meet other users more regularly through the user groups. A panel of user groups members from there regions joined us to explain. Many of the panelists have been using IFS for over a decade – and have been parts of user groups for as long. Some have paid resources, some are all volunteer. Knowledge sharing around functionality changes and upgrades is a key benefit, says the panel. The more you put into the user groups, the more you tend to get out. 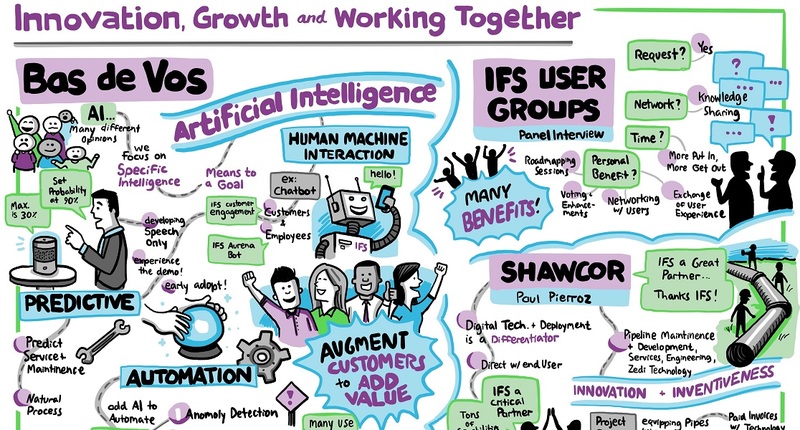 Marsh suggests that being a collective voice to influence IFS is one great advantage, and some of the changes that have come to the product, as a result, are more than worth his time. Lackas finds learning how other users are deploying the system is invaluable – it throws up non-obvious ways of working that can change businesses. Shawcor has been using IFS for 12 years. We have 14 people here at the World Conference, and we think you’ve hit the bullseye with the new updates – I keep hearing it from our people. I’ve bet my career on technology being a differentiator for our business. Our company had been using IT as a support function but is now moving it to the front of the business, and customer-facing roles. Shawcor is a publicly-traded global energy services company, founded in the 40s in Canada, with over 6000 employees, across five groups. We apply high-end coating to pipes and do non-destructive testing of them. We have also moved into manufacturing composite pipe, which is non-corrosive, and into pipeline consulting, too. We’ve also acquired technology that transfers information in real-time from oil fields. We’re strong in both innovation and inventiveness. Many companies innovate. Very few invent. We don’t hire anyone who isn’t excited by technology. We are very dependent on the flexibility of IFS because they’re a diverse business. Shawcor concentrates on sharing technologies across the group – a coating used over girth welds on pipes can also be found in your car. One recent project is a pipeline from Texas to Mexico, piping natural gas. Shawcor coated the pipeline with fusion bond epoxy and 3 inches of concrete to keep the pipe both rust-free and on the bottom of the seabed. Pipes filled with gas have a tendency to float… The project involved 50,000 pipes, half of them imported. Each of the pipes was equipped with RFID endcaps, to make tracking and customs clearing of pipes seamless. It was one of the most successful projects in our history, and it came in on budget and on time. We’re tracking assets, running pipeline maintenance, to extend the life of pipelines, and to move our business from one dependent on capex to one that also gets opex revenue. Pipeline inspections are now tech-mediated. They take a high definition photo of a weld and send it in real time to a highly specialized technician. Those technicians are rare and expensive, so this means we only have to deploy them in the field to pipes when they identify a problem. Shawcor has 1200 IFS users. We take IFS products and map them to our eight core business processes. If we want to light up data for our customers the data in IFS needs to be right. Shawcor Inside highly influences Shawcor Outside. Shawcor’s technology strategy is to use it to create value both inside and outside the company. IFS has tremendous power – it’s up to use to work with IFS to deliver that for our business. Industrial companies will be the next set of digital game changers. We have the base data. We touch the pipe more often than anyone else. With these tools, we can change the digital game from the pipe out. A job well done! This is a beautiful piece. Trust me, the sky is your limit.